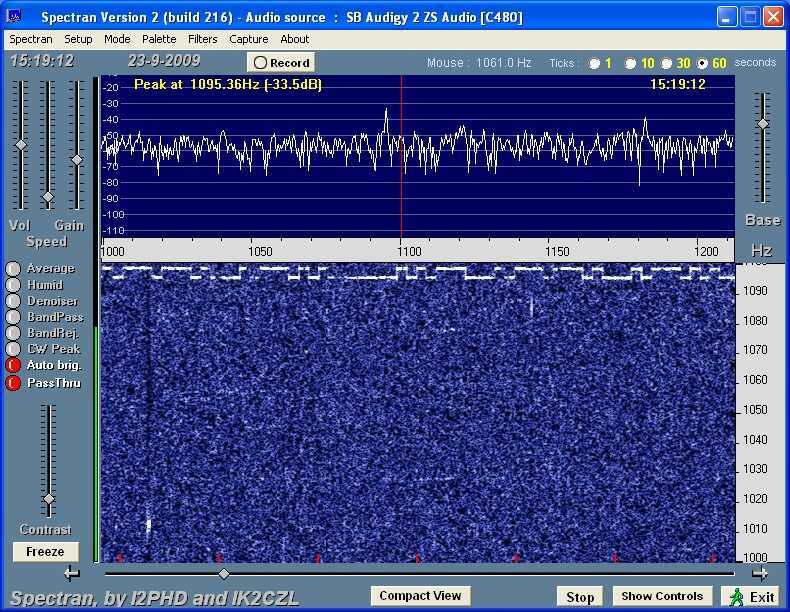 The Tropical QRSS beacon gets another outing! 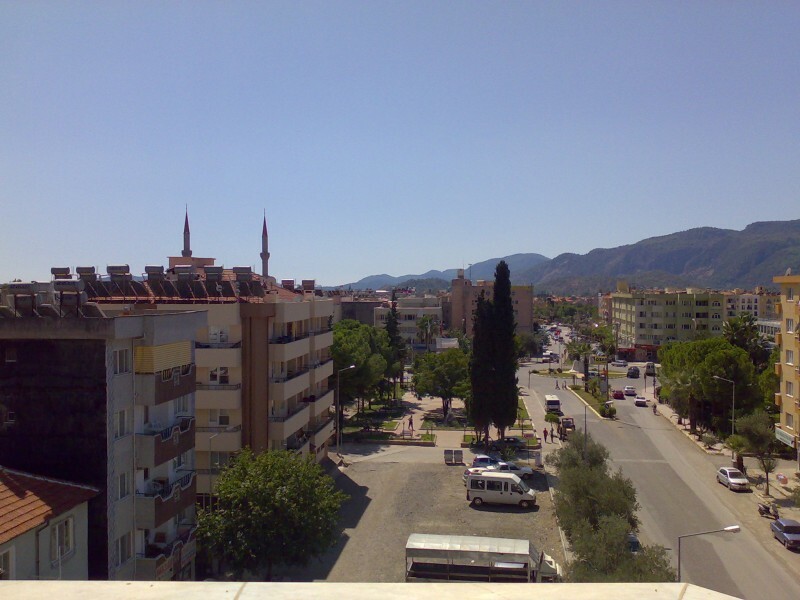 This time to the Mediterranean, more specifically the South-West corner of Turkey. 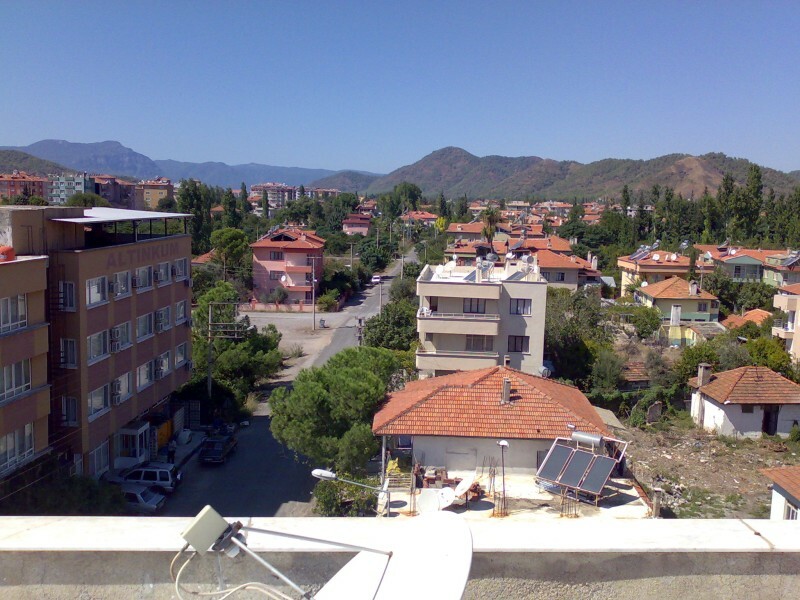 The antenna installation is on top of a 5-storey apartment building and the power supply this time is four D-cell batteries in series. DURACELL, because everybody knows only the Duracell bunny reaches the top of the mountain. 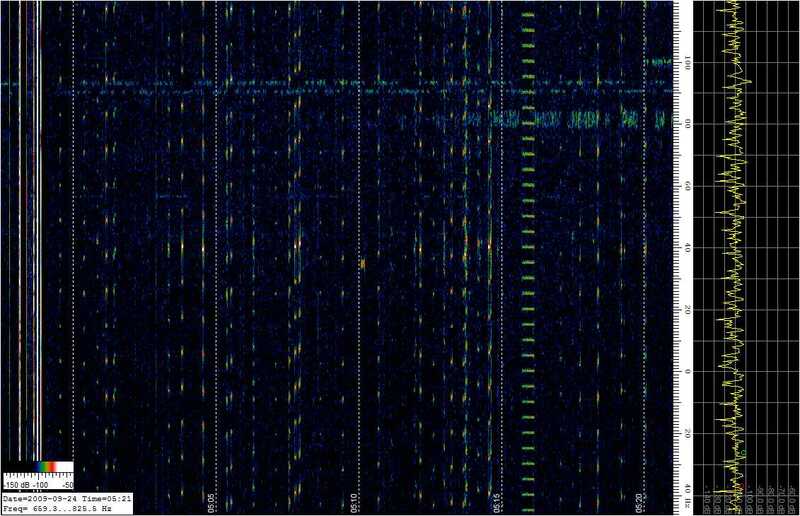 In all, the beacon ran for 6 days and was copied by 11 stations as follows: John VK6JY, Pierre ON5SL, Joachim PA1GSJ, Mike G8NXD, Claudio I2NDT, Johan ON5EX, Laurance KL1X, Peter ZL2IK, Brian VK6ABM, Paolo IZ1KXQ, Michael DL4MGM. The transmitter used was the same one I took with me to Grenda, Caribbean. Click here to read about the construction and the Caribbean operation. 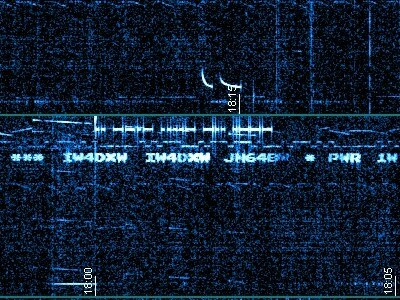 The local copy of the signal (using my 30m QRSS receiver) is shown above right. I did not adjust the transmitter at all between these two DXpeditions, so hoped the frequency would remain as per the Caribbean operation i.e. around 10,140,060. In the event it ended up around 35Hz higher, perhaps due to a different power supply voltage, different (higher) temperature, or different antenna loading. 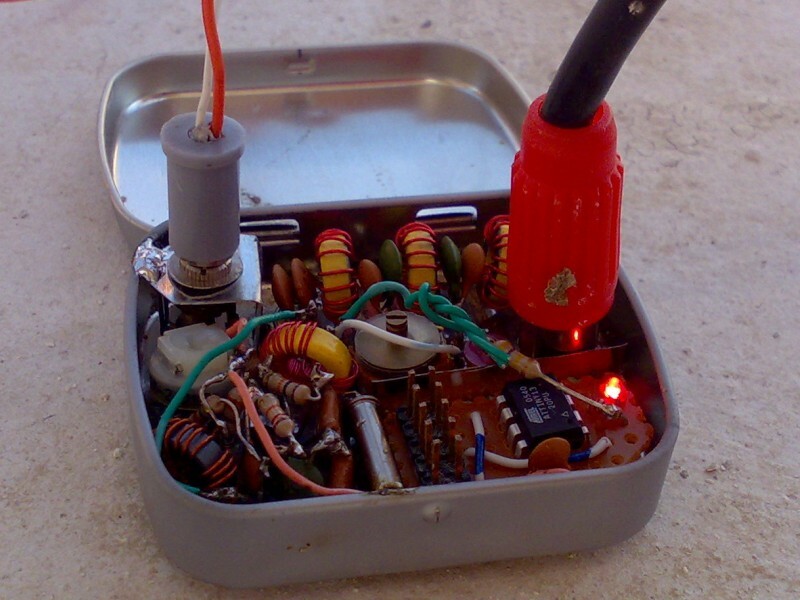 The power supply this time consisted of four D-cell Duracell Alkaline batteries. 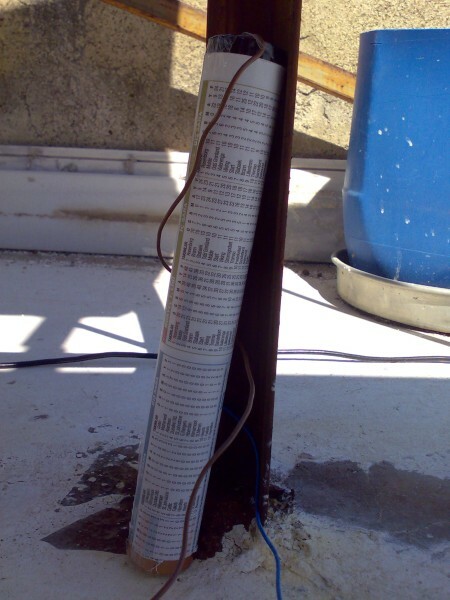 The batteries were rolled up in series in a sheet of newspaper fixed with selotape. The wires to the power plug (2.5mm jack plug) were taped to the top and bottom of the battery pack. Simple, and it works! The following photos show the transmitter installtion, and the battery pack. 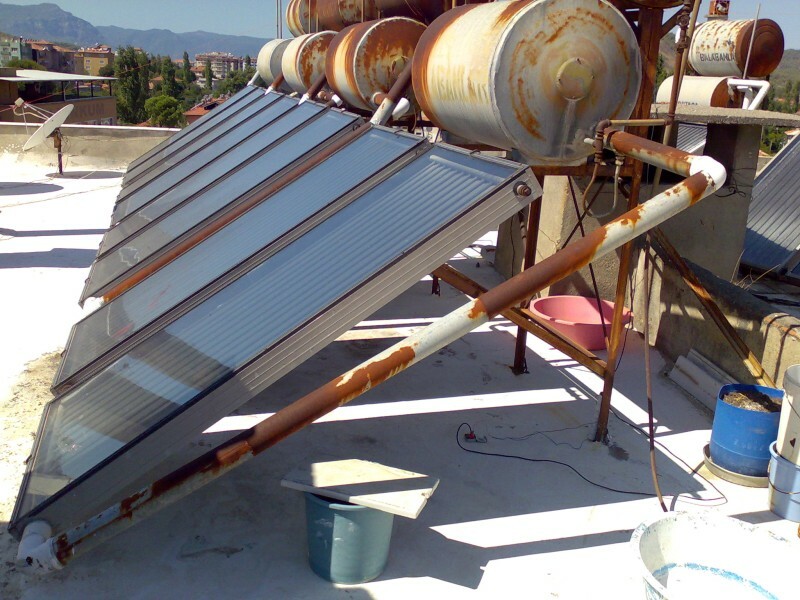 I positioned the transmitter under a solar heating panel to keep it in the shade, since in sunlight the temperature gets pretty hot up there on the roof! I put the transmitter in a plastic bag (not shown) to keep it dry when it rains. Next, some photos of the antenna. The orientation is approximately NorthEast to SouthWest, which should give the antenna theoretically the best propagation into the NorthWest and SouthEast directions, which I roughly hope would be Northern Europe and Australia respectively. However all directions were somewhat guesswork, roughly orientated using the position of the sun at around noon when the transmitter was set up. 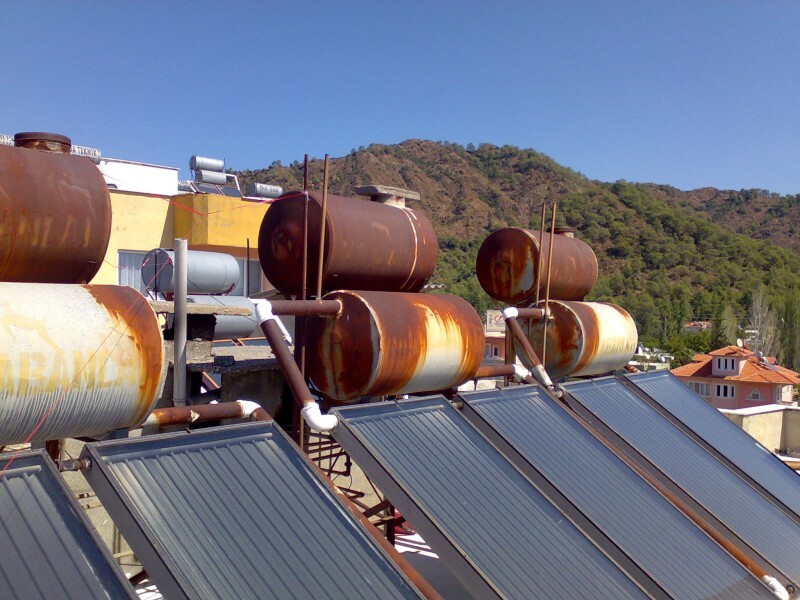 Note that there are many tanks, heating panels, pipes and cables all around and the antenna passes in amongst them. 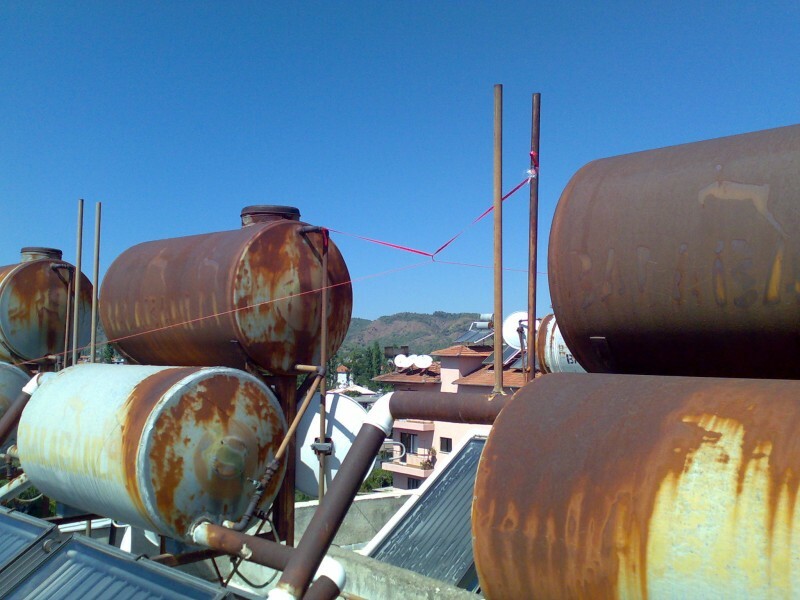 I used some red ribbon (ex Christmas) to tie the wire roughly in the middle where there is a gap between the tanks. At one end the wire is anchored to a can of something-who-knows-what, at the other to a piece of the building structure. Within a few hours of switching on the transmitter (15:15 UT), I had reports from my friend John VK6JY in Albany, Australia! QRG 094/098 approaching midnight in Albany (UT + 8). The solid white line at 2100 (10,140,100) is John's signal generator to provide a calibration reference. This is the first time John has copied my signal from ANYWHERE in the world, and we are both very excited about it! 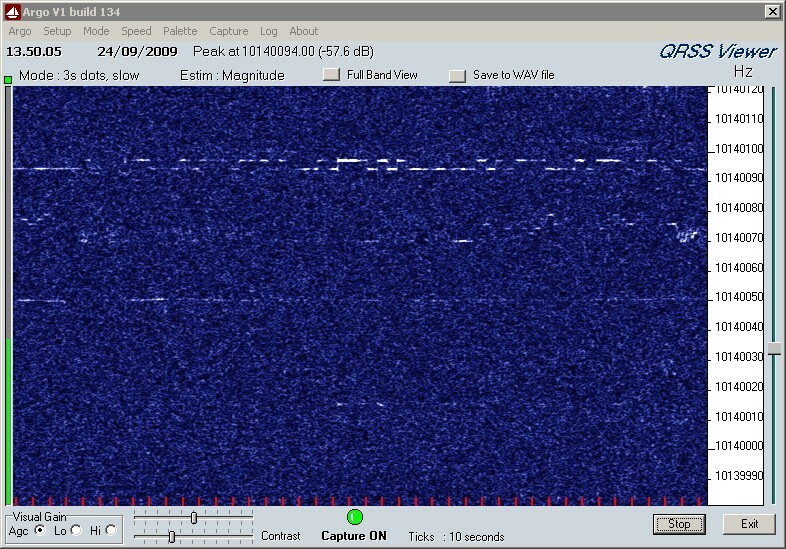 Almost exactly the same time (15:19 UT) Pierre reported reception in Belgium (JO10tt Etikhove). VERY solid copy there at around QRG 096 (consistent with John's report). 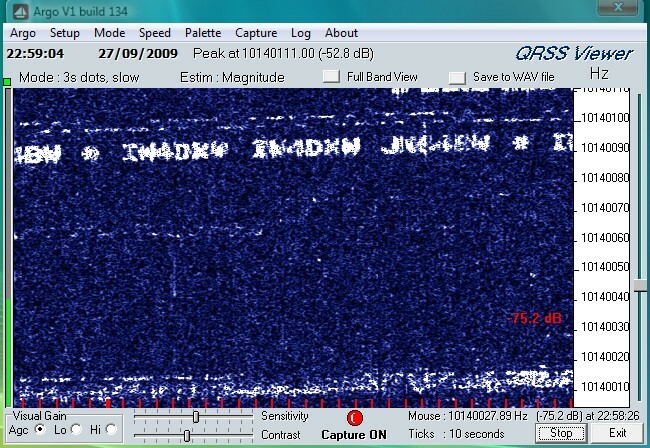 Joachim sent two reports from Holland JO22DA showing my signal at 090 +/- 2 at 19:30. Joachim reports that my signal was visible for the better part of the day, in quite good condx. 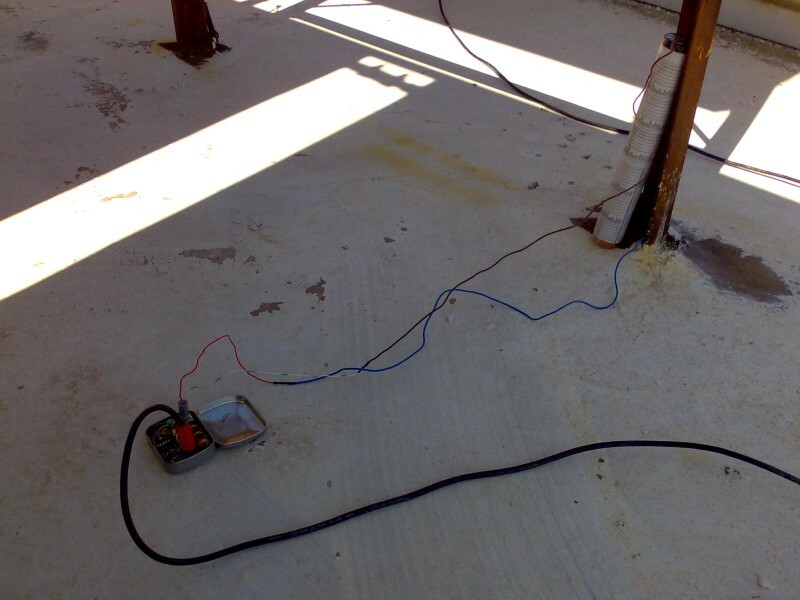 He uses a setup specifically for this event, consisting of indoor rockloop antenna orientated East-West. 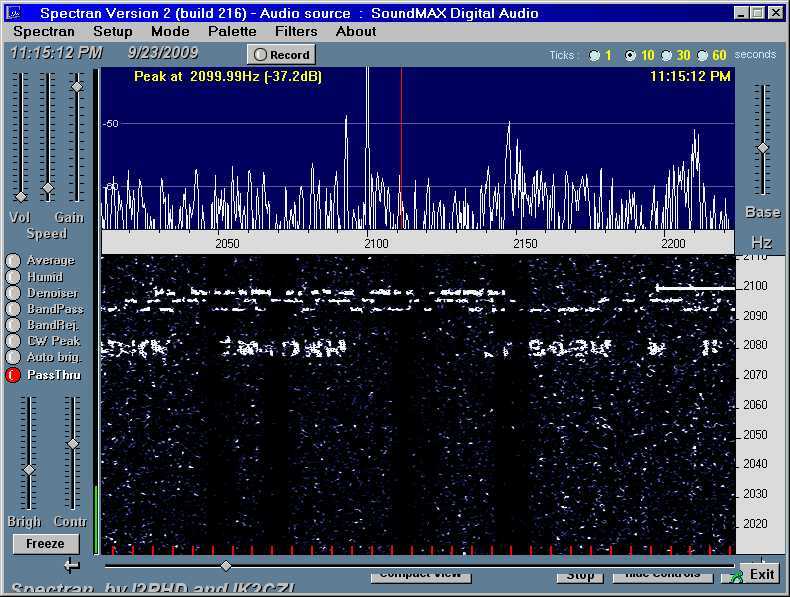 LEFT: Mike G8NXD: Very nice strong copy on the online grabber of Mike in the UK, IO70JE at 15:29 UT on 23-Sep-09 at around 090/094. MIDDLE: Claudio I2NDT: This one was visible briefly on Claudio's online grabber the following day (24-Sep-09) at 13:50 UT. 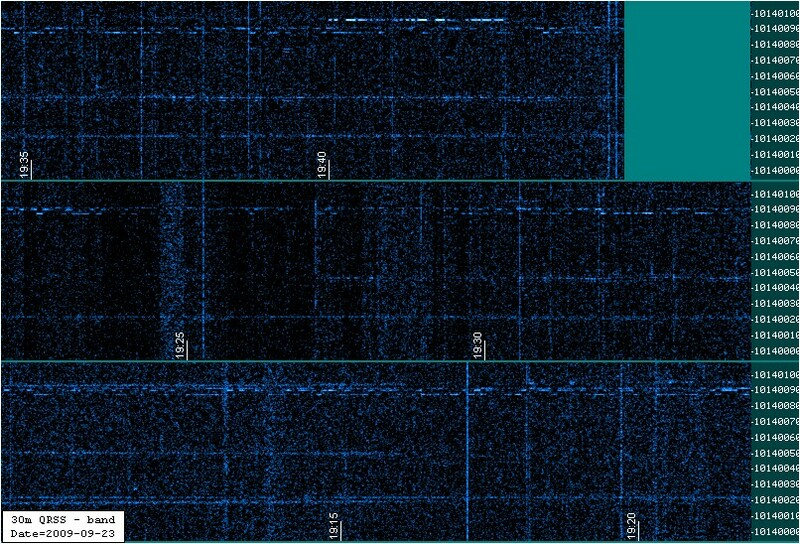 The frequency is still about 094/098. 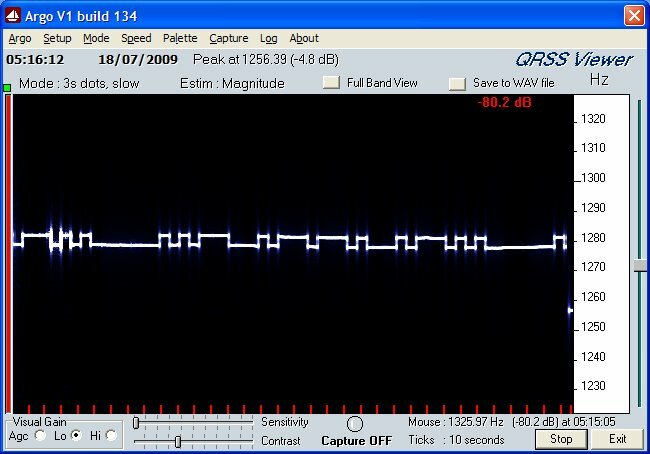 RIGHT: Johan ON5EX: Here my signal is easily visible on Johan ON5EX's online grabber at 16:30 UT on 23-Sep-09. 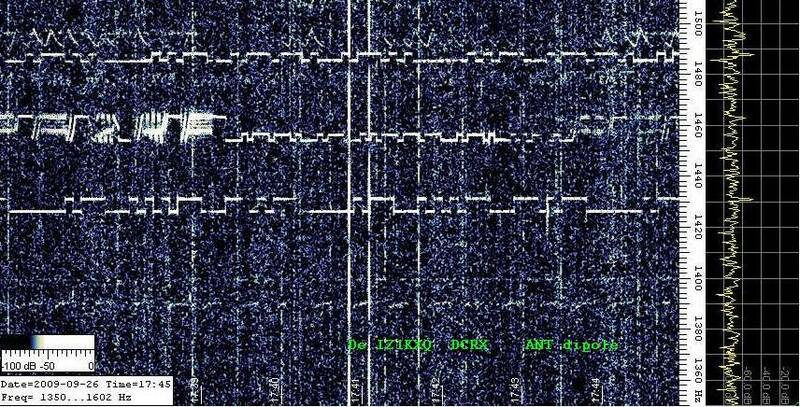 The beacon continued to be visible at times on the grabbers of G8NXD, I2NDT, ON5EX and PA1GSJ. 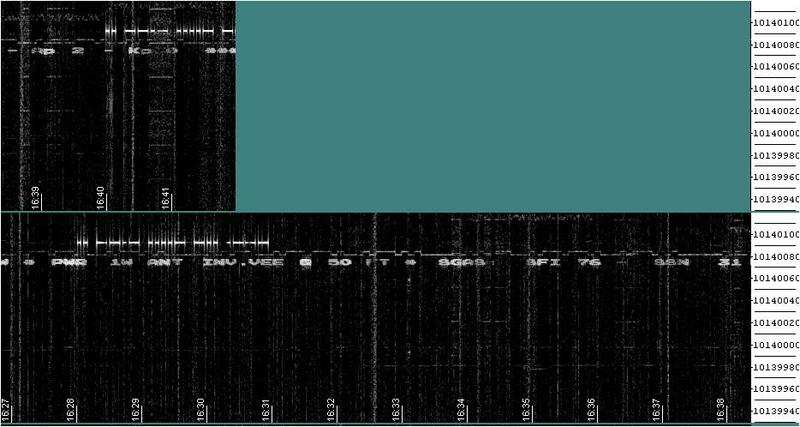 Interestingly, the signal was very consistent on Johan ON5EX's grabber, almost always visible and often alone on the screen! I even saw traces on KL1X's grabber in Alaska, see below! 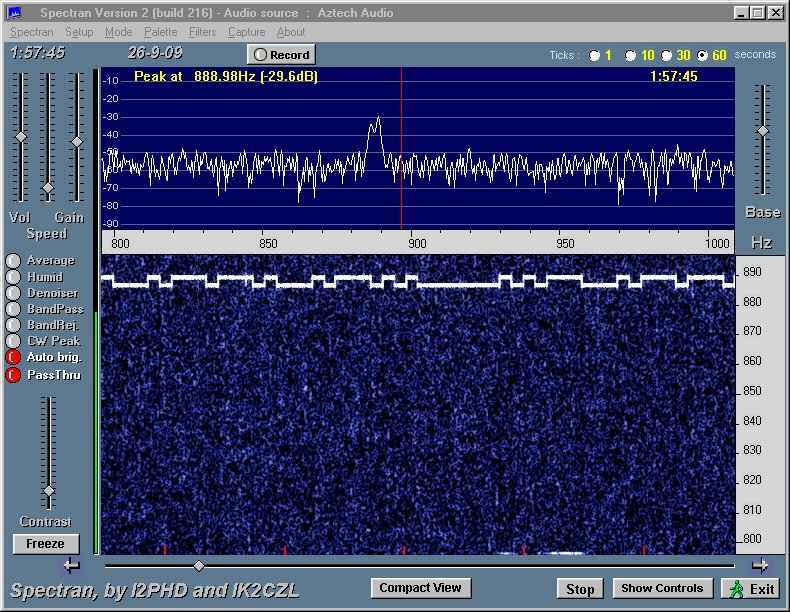 VK6ABM sent a report from the Perth Hills, Western Australia but sent no screenshot image. 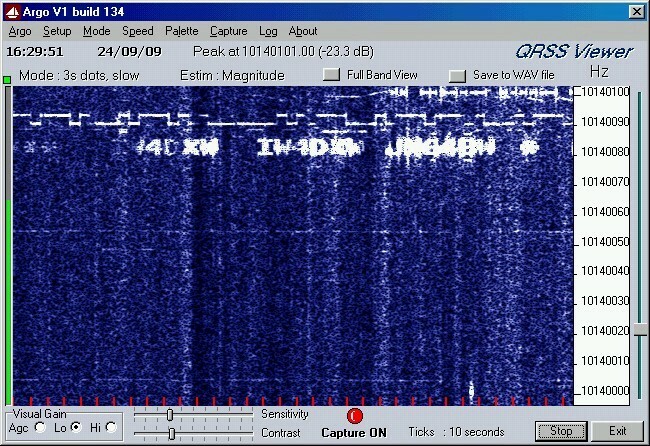 Brian copied the signal at '92 at around 1440 UTC (on 24-Sep-09) using ARGO. Peter ZL2IK copied me for the first time, see below! Amazing 23,097km long path! Peter later copied me on the short path too. John VK6JY sent more reports too! LEFT: Laurance KL1X: I saw this on Lawrance's grabber today, clearly identifiable. Lawrance is in Alaska, BP51IP! Amazing stuff! MIDDLE: Joachim PA1GSJ: Using an FT817 this time. This one is actually from 24'th (Thursday) at around 1800Z and Joachim reports better conditions than Wednesday. RIGHT: Peter ZL2IK: Amazing long path report from Peter in Whangarei, New Zealand at a calculated long path distance of 23,097km! Equipment used was an Icom IC756Pro3 receiver using 500Hz bandwidth and a 80 metre 32% off centre fed dipole at 15 metres. 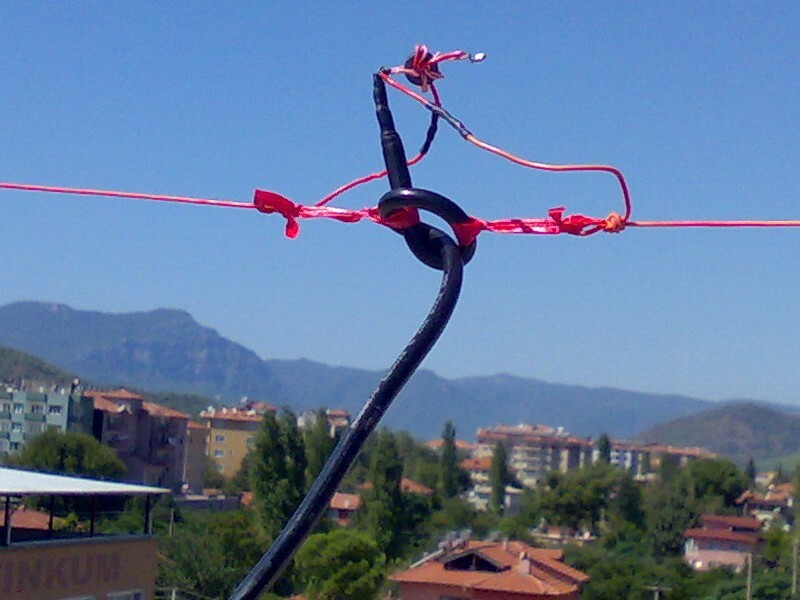 LEFT: Paolo IZ1KXQ sent this fine image from Sarzana, Italy! RIGHT: Pierre ON5SL: At about the same time, Pierre sent this excellent report (01:57), probably the strongest reception report I have ever received of any of my beacon operations! I wonder, did Pierre take a quick trip down to Turkey and park his radio receiver right next to the beacon transmitter? Here's one reception report from Brain VK6ABM near Perth, Western Australia. Brian's first report was on 25-Sep-09, this one is even nicer and from 27-Sep-09. Finally, a most interesting series of screenshots was received from Michael DL4MGM a few days after the cessation of the operation. Michael had copied the signal every day and sent a series of screenshots of the 1 hour starting at 0400Z. Michael is in Regensburg, southern Germany, JN69AA and uses a USB powered lower sideband direct conversion receiver (I suspect, similar to mine). 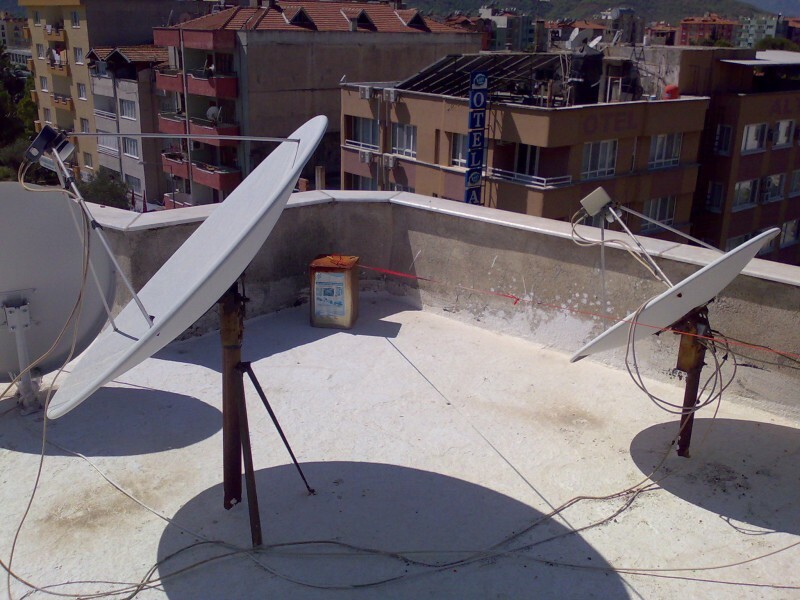 He first saw the transmission at 10:11 UT on 23-Sep-09 which is not long after when I switched on the beacon on the rooftop in Turkey! Michael's last spot was shortly after 0500Z on 29-Sep-09, the day the beacon was switched off. Michael provides a series of daily screenshots, each covering 1 hour starting at 0400Z. At his location, on most of the days the signal pops up very reliably, starting (like a switch!) at between 0400 and 0430Z. Very interesting! 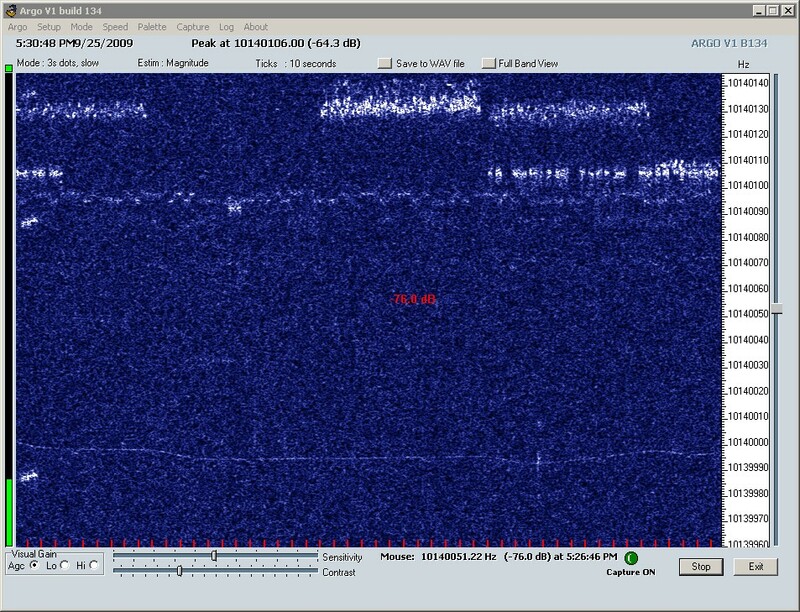 But on the final day (29-Sep-09) the signal appeared shortly before 0400. Michael did NOT see any boost around 0100 on any of the days, as was observed by the ON stations (Johan ON5EX and Pierre ON5SL). 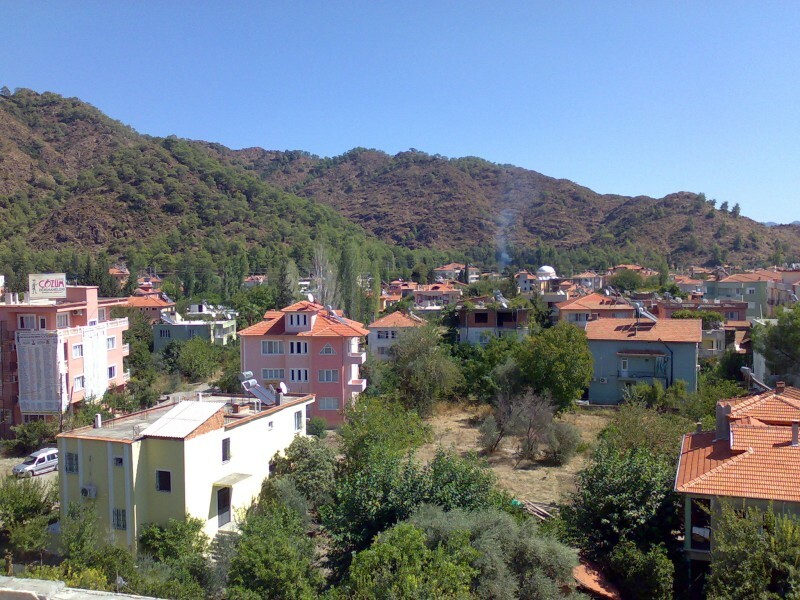 Interestingly, the local sunrise in Turkey is around 7am, which would be 0400Z. So the reception Michael sees is starting around 15 minutes after sunrise at the beacon transmission site! Thanks for a very interesting series of screenshots Michael and the detailed notes! I am showing below, just one image from Michael's run. This is an image showing the appearance of the signal at around 0415Z on 24-Sep-09. 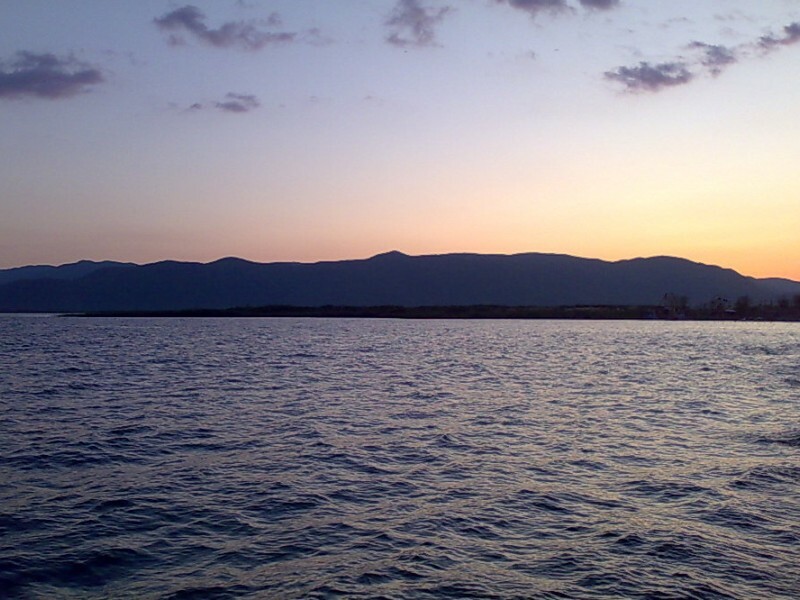 The last known reception report was from Michael DL4MGM shortly after 05:00Z on 29-Sep-09, and later the same day the beacon was QRT and packed up ready for the trip home. The batteries showed no sign of approaching emptiness! No sign of power reduction or frequency drift that might accompany a decline in battery voltage. It would have been nice to be able to continue the experiment a little longer, to see how long the batteries would last!